First up, my own lil' wishlist. 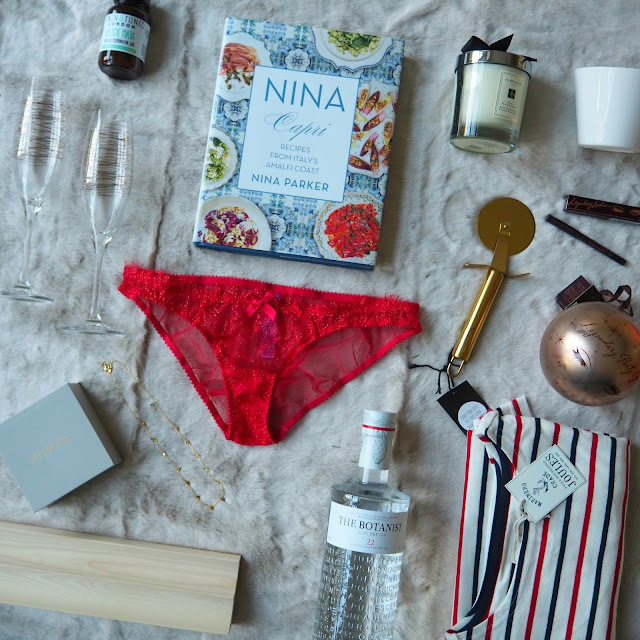 Not forgetting the essential red knickers for the festive season (here) I'm getting to the stage of life where as long as I have gin (preferably The Botanist, here and out of fancy champagne glasses like these) and stripes (the one featured is a new-in from Joules here) then I'm ok. I've also come to appreciate a decent candle and Jo Malone's pine and eucalyptus is my favourite here - smell wise think Christmas trees with a zing... Cooking wise I'm going to kid myself in thinking I could go pro with Nina Parker's Capri, when in reality I'll keep up the Deliveroo orders and use a shiny, golden pizza cutter from Amara here, whilst wearing my find-of-the-year detox face mask from friends at Skin and Tonic here. I'm also very keen for anything that makes looking good easy so Charlotte Tilbury's handbag sizes Legendary Eyes stocking filler is a must, here. Equally easy-wear bling from Missoma (so shocked how much this gets commented on, as it's so simple) is a must have for me this Christmas, my necklace here and pinky-finger rings here (£34!!!) are two of my favourite things. Lets not forget the practical world too (having moved into a new place this year); Hay is the best for stationary, storage and trinkets and this pine desk tidy is gorgeous. Adding a few cheeky extras into the mix I've just stumbled upon these amazing Nike trainers which are amazing all rounders (I've worn them solidly for work-out and play ever since they arrived). The rose gold detail, combined the with black/white colours makes them pretty much perfect. Find them here. Secondly, from the moment Jo Malone's Orange Blossom arrived my boyfriend and I have been fighting over which of us wears it. Literally the most gorgeous scent ever, here. Finally for this post, for him. 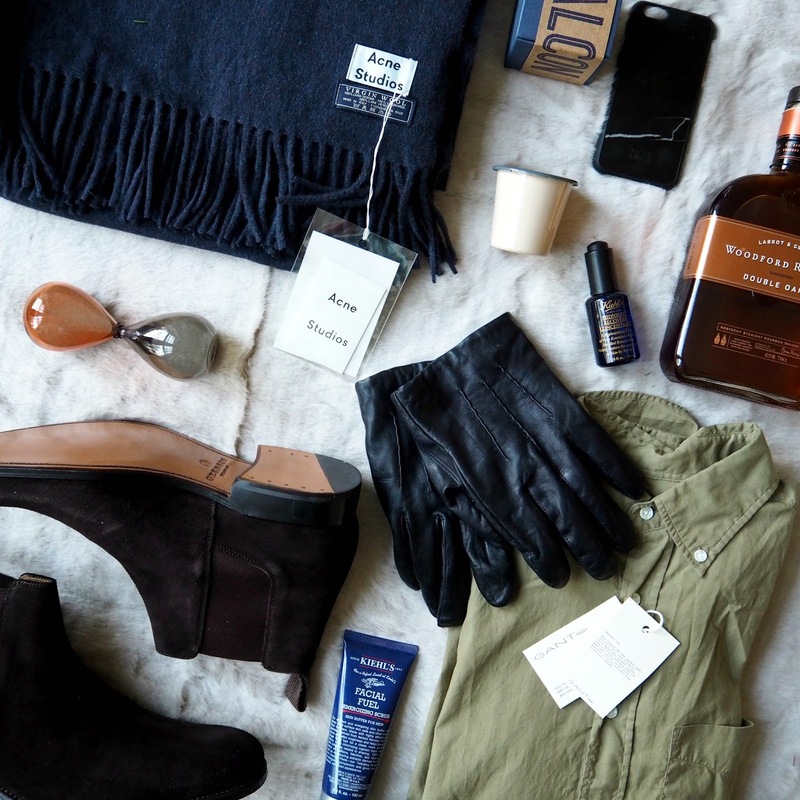 A tricky one so here is what my boyfriend is actually getting for Christmas (only hoping he doesn't read this). He's really tricky because even though he goes shopping once a year he has a remarkably strong opinion on clothes. So I've gone for sturdy basics; leather black driving gloves from GANT here, brown suede Chelsea boots from Grenson here and a (wild card) Acne navy woollen scarf from Mr Porter here. Last up, he never says no to Kiehls which for me is hands down the best mens' brand to buy if you're a bit unsure on skin type etc. It seems to work for everyone. I steal his Facial Fuel stuff all the time so it's pretty much just a replacement, so John Lewis' scrub and cream combo offer is great, here. Ooh and if you're trying to get him into candles you can tell him this one is made of tin, made for cooks and can double as a shot glass if he lets you burn it out. Thank you, Falcon! 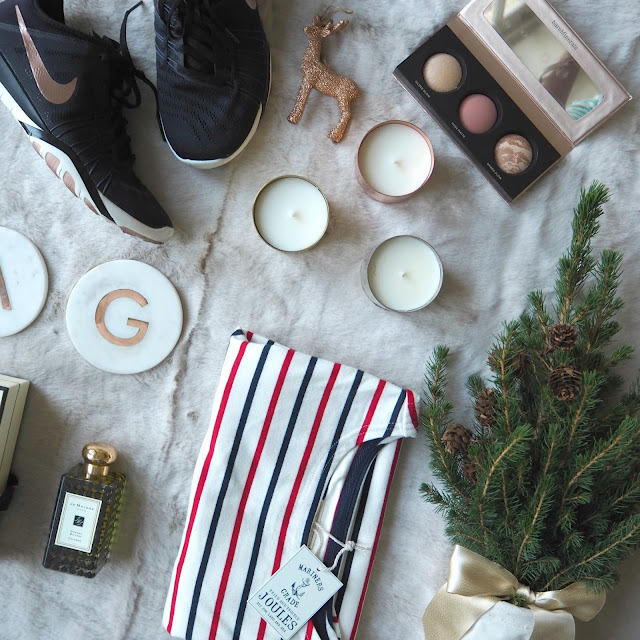 Stay tuned for the second round of my gift guide on the blog next weekend!